BankAtlantic's Patricia Barrientos-Maiz was appointed Chair Elect of the Latin Chamber of Commerce of Broward County. HOLLYWOOD, FL. - BankAtlantic, of Florida announced that Patricia Barrientos-Maiz, Market Manager of its South Pembroke branch, has been appointed Chair Elect of the Board of Directors of the Latin Chamber of Commerce of Broward County. Mrs. Barrientos-Maiz who is responsible for sales, business development and local market management for BankAtlantic's South Pembroke branch has over 17 years of banking experience in the Pembroke Pines area. "We are very proud of Patricia's accomplishments and involvement in the Latin Chamber of Commerce. It is people like Patricia whose professional influence build and sustain cohesive relationships, which the entire business community can benefit from," said Jarett Levan, BankAtlantic's President. 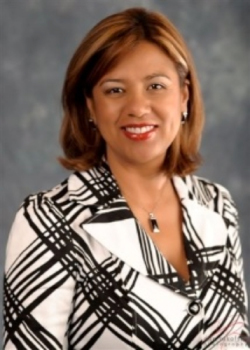 "We congratulate Patricia on her new appointment as Chair Elect of the Board of Directors and wish her and the Latin Chamber of Commerce continued success," he added. Mrs. Barrientos-Maiz is also a current member of Mujeres Latinas Impulsando Mujeres Latinas and Dominican Republic Chamber of Commerce. She is also a member of Hispanic Unity of Florida where she serves as Committee organizer of Hispanic Fest and their Annual Gala "Noche de Estrellas". Patricia is a graduate of Barry University where she earned a Bachelor degree in Business Administration with a concentration in Information Technology and a Certificate in Human Resources. She resides in the City of Pembroke Pines. About the Latin Chamber of Commerce of Broward County: The Latin Chamber of Commerce of Broward was founded in 1987. We are located in the heart of Broward County, in Hollywood FL. Our Mission is to enhance economic growth and stability to our members and our community at large. We have 425 members comprised of community leaders, small and large business, executives and professionals from a broad range of nationalities and operations. We coordinate recurring events such as: Bimonthly Business Networking events (every other Wednesday) as well as Monthly Luncheons (last Friday of every month). In addition we host a Scholarship Luncheon, a Legislative Luncheon, a Business Expo and a Gala. These events help us develop the potential to recruit new members and to pass on marketing messages to others. For more information, please call (954) 961-6386, write 121 South 61st Terrace, Hollywood, Florida 33023, email info@latinchamberbroward.com, or visit www.latinchamberbroward.com.